Kendal at Oberlin residents and staff feel strongly about taking an active role in environmental stewardship. It’s not something that is adhered to only on Earth Day. It’s part of Kendal’s values and everyday practices. Our collective conscience tells us, “to tread ever more lightly upon the earth.” This theme is propagated by the decisions Kendal makes and the actions it takes. There is acceptance that global warming is a serious concern for our planet. At the time Kendal at Oberlin was built twenty+ years ago, the Founders and the Kendal organization had a common concern about the use and conservation of natural resources. The Founders were drawn to Kendal’s philosophy for building and operating its communities in an ecologically sound and socially responsible manner. Thus our commitment to protect the beautiful environment around us. More recently, our campus became an arboretum, registered by ArbNet. In spring of 2016, we celebrated the opening of The John Bartram Arboretum at Kendal at Oberlin. Stewardship of Kendal’s 100+ acre grounds, now designated as an accredited arboretum, ensures its conservation as a place where trees and other plants are grown for enjoyment, education and celebration of the natural environment…a place that residents, staff and the greater community can benefit from for years to come. In addition, wherever possible, materials with recyclable content and those that are regionally manufactured are used. Kendal at Oberlin’s dining services uses compostable paper products and locally grown produce whenever possible. Used frying oil is donated to a local biodiesel manufacturer. When Kendal opened in 1993, this resident-driven community began establishing committees, where there were areas of interest. The Environmental Concerns Committee is a long-standing committee, with the task of identifying concerns of environmental sustainability; educating; developing action programs to address problems; and encouraging participation from the Kendal community; and consulting and cooperating with Oberlin College and the City of Oberlin. There are also committees that focus on Energy and Recycling concerns. Additionally, with Oberlin being such a walkable city, residents and staff often choose walking and biking as modes of transportation, conserving fuel and staying fit at the same time. The Oberlin Project is “a joint effort of The city of Oberlin and Oberlin College and private and institutional partners to create a national model for sustainable communities.” Kendal is part of that effort. The city and college have made a commitment to being one of the nation’s first climate positive communities. Plans are under way to create a 13-acre “Green Arts District” in the heart of downtown Oberlin, emphasizing the community’s commitment to both culture and sustainability. 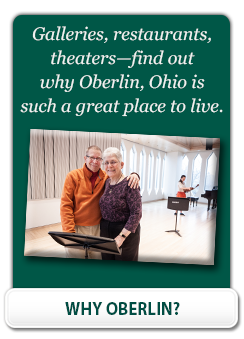 Today’s and tomorrow’s Kendal at Oberlin residents look for many of the same features that the Founders valued…a community that takes advantage of the natural beauty of the land, is sensitive to its own environment, and that of the larger community. Kendal at Oberlin continues to become a deeper shade of green.